Puppy house training is easy...when you know how! If you’re one of the lucky few K9 Magazine readers who’ve recently acquired or are thinking of getting a new puppy, congratulations! You’ve done your homework, selected the breed that’s right for you and best matches your lifestyle. You’ve read your copies of K9 Magazine, bringing even more joy to your exciting new puppy ownership experience and now we’re going to make it even better by delivering a brand new puppy advice article for you in our puppy training advice series. We'll begin with the issue that most new puppy owners need advice with the most in the first few weeks after bringing puppy home, house training the puppy! House Training a Puppy: 5 Second Tip! Most animals that are born in a nest have an instinctive desire to move away from their nest/living area in order to relieve themselves. When learning to house train your new pup, it's important to remember that dogs are 'pre-programmed' to want to go to the toilet away from their home/house. This provides a huge advantage in the puppy house training process. They will do so without being taught as soon as they are able. It is an in-built mechanism in nesting animals and dogs are no exception. At the age of about three weeks, they will begin to leave the sleeping area to urinate. Your job when house training a puppy is to teach them that our house is our and their nests, and that they have to move outside when they want to relieve themselves. 1. Shortly after each feeding, playing, exercise, and any excitement. It is important to stay outside with him. Be patient and wait. As soon as he begins, say a chosen phrase to him such as "Toilet!". When he has finished, praise enthusiastically and play a game with him. Keep the area clean by picking up any mess and flushing it down the toilet. Puppies are easily distracted when outside, so having the patience to stay with him until he has settled down is essential. If you leave him to it, he will probably run to the back door and spend the rest of the time trying to get back in with you. Once you let him in, the stress of the separation, together with the increased excitement and exercise, will make him want to go, and you will be left with a mess inside and an uneducated puppy. However, there is no need to stay outdoors for hours, waiting for him to go. Wait for a few minutes only, and if nothing happens, take him inside and try again a little later. If at any time of the day you notice him sniffing the floor and circling or getting ready to squat, immediately interrupt him and take him outside. Let him walk. Do not pick him up, or he will not learn the vital link in the process, which is: "When I need to go, I need to get to the back door and into the garden." If, at any time, you catch him in the act of going in the house, quickly issue him with a stern command of, “No!” The command should be loud enough to capture his undivided attention and to stop him mid-flow, but not so loud that he runs for cover. 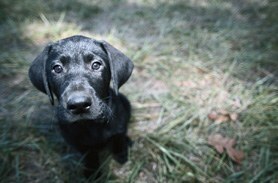 Do not punish or get angry; the distress this causes your puppy will inhibit the learning process. He will also begin to avoid going to the toilet in front of you because he knows it makes you angry and will sneak away to do it, making it harder for you to teach him the correct behaviour. Without fuss, simply move him outside and let him finish his ‘business’, praising heavily when he does. Toilet training should not end with house breaking. If you want to avoid the unpleasant but necessary task of picking up after your pet in the street, it makes sense to train him to go before you leave home. This is not as difficult as it may seem but requires a fair amount of patience in the early stages. If you have been successfully working at the housebreaking process, you will, by the time you are able to take your puppy out, have a particular phrase that your puppy will associate with going to the toilet. You should also have a fairly regular routine and will have some idea of when your puppy needs to go. Try to arrange your first walk to coincide with this time. Go out to the garden as usual, repeating your chosen phrase until your puppy does what is required. Praise enthusiastically and then take him out for a walk. If he does not go to the toilet, take him back inside for a while and try again later. If you take your dog out for a walk only after he has been to the toilet, he will eventually begin to realise that producing the required deposit results in a walk. A lot of puppy owners use a technique known as ‘crate training’ in order to speed up the housebreaking process. Crate training is successful because the puppy is far less likely to have accidents in the house as they are confined, at sleeping times, to a smaller area which resembles a nest more than house does. The puppy is therefore more naturally inclined to hold their urge to ‘go’ until they are let out of the crate and it then becomes easy to time and anticipate your puppies toilet breaks and thus issuing more praise, less instances of the puppy going in the house and a general acceleration of the entire process is easier. Crate training is a personal choice and the principles of housetraining remain the same. Try to spot the tell tale signs when your puppy is telling you they need the toilet. These include circling, sniffing in corners, whining for no apparent reason and any time shortly after eating or drinking. Remember, a small puppy’s bladder is physically very small and they actually can’t hold their toilet movements in for long periods at a time. It is inevitable that a young puppy WILL have accidents in the home but as they get older and in combination with a well planned house training program, they will get better. Too many puppies end up in rescue homes just because owners didn’t anticipate the time and patience required to achieve perfect house manners. House training a puppy is one of the key components to having a happy, healthy contented dog. Achieving puppy house training perfection may take a little while and it might test your patience. In some cases you might think there is no end in sight, but persist. Sometimes house training a puppy is like teaching a child to ride a bike, there might be tears tantrums and the odd falling off, but then one day it just clicks! Came across a question on what to do with a difficult puppy who won't learn house breaking and the owners are at the end of their tether, even thinking about getting rid of the puppy. This is their story: "We got a new puppy about a month ago. She was 4 months old when we got her, and we're having a difficult time training her. I take her outside every 2 hours, and within 10 minutes after eating. If she doesn't go outside, I bring her in and crate her for 15 minutes, then try again. She will hold it for over an hour, and go on the floor as soon as I allow her any freedom. I feel guilty about keeping her constantly crated, but if I don't she uses our living room as a toilet and tears up the furniture, pillows, etc if she's unsupervised for even ten minutes. My husband is ready to get rid of her. I'm trying my best to correct her behaviour, but I'm not sure what I'm doing wrong, or if I'm just not being patient enough. Could you tell me why she won't use the bathroom outside?" The 2 hour schedule is right on track for a training a puppy, you must remember that puppies can't hold their functions for long and when they want to go they will go. Give the puppy time to explore her surroundings while outside as they will want to do this: smell the grass, chew on twigs, chase a bug, if you don't have the time then have a quick play session (something I don't normally recommend because we want to make the puppy learn that outside is to do her business just for now) anyhow have the play session with the puppy outside, maybe a game of tug of war and or some sort of go fetch something, when the puppy is tired she will go for sure. This play session can also happen inside and then take the puppy outside as soon as you are done playing because she will want to go. Always remember to keep the puppy confined to her crate when you are not able to watch her fully as her will go when she wants to. If she must be loose then tie her to your waist by her leash so that you have her close and that you will be able to catch her every move before she relieve herself inside. If you see or catch her in the act of relieving herself inside don't scold her or beat but pick her up and get her outsider as soon as possible. Another good deterrent is to get a water bottle drink all the water of out it and then but some pebbles in the bottle enough to cover the bottom lets say an inch deep and cover it back as soon as the puppy is doing something that you don't want shake the bottle this will startle the puppy so that she stops her bad action. As soon as you take your puppy out of her crate take her outside immediately say go potty until the puppy starts doing her business stop once she starts, as soon as she is done praise her lavishly. Remember that a puppy will take sometime to learn house breaking she could be a year old before she is fully house broken. Are you using the best puppy housetraining method for your situation? Follow this handy guide to find out. The Traditional or Direct Method This is best when you have easy access to a backyard and can give your new puppy the time and attention he deserves. It's also the most popular method. It's based on a frequent schedule of taking your puppy into the backyard. You use a designated area for it to "do its business". If your puppy does what you want, you reward him or her with lots of praise during and immediately after the event. In addition to the regular schedule of visits to the backyard, you supplement this with vigilance and watching for signs that your puppy needs to go outside... in which case you quickly take him to the designated area. With time and repetition, your puppy learns that this is what it should do. The Paper Training Method This is usually the best method when you don't have easy access to outside and the puppy will be expected to "do its business" inside the house. It follows the same approach as the traditional or direct training method... with the difference that the designated area is inside the house and usually consists of a pile of old newspapers. Alternatively you can use dog potty trays, pads or litter boxes. The Crate Training Method This is based on the idea that the crate is the puppy's den. Puppies and dogs by instinct don't want to use their den as a toilet. The crate training method can be combined successfully with the traditional or direct method and the paper training method. Establishing a routine: Both human and canines are creatures of habit, we are both highly routine oriented. This means you must try to stick to the same schedule in order for your dog to understand that if they hold their urine they will be able to go out soon. The problem when you do not establish a routine is that they cannot predict when they will be able to go outside and will simply release themselves whenever they have to go! Meal time: Scheduled feedings are also VERY important when house training. What goes in must come out! So if you're leaving food down all day, your dog will need to go all day! By feeding scheduled meals you will know exactly when your dog needs to go out (usually immediately after meals depending on your dogs age). Confinement: Any dog that is not completely housebroken should not have complete freedom of the house! Use baby gates to block off rooms, limit your dog to 1 or two rooms in the house. Freedom is earned, if your dog is one who goes off in another room to potty, let's not give him/her the option to do so and attach the leash to YOU. This way she/he cannot sneak off and go in a different room! The Crate: The reason the crate works is because dogs have a rule. This rule is that they will not poop/pee where they eat and sleep. So if the crate is the correct size (just large enough for them to turn around, no marathon running!) they will not pee/poop in their crate. Also, dogs are den animals, meaning they like confinement, it is a safe spot! The crate may look big and scary to us, but to a dog it is a safe den. Any time you know you cannot watch your dog, put them in their crate. When you let them out make sure you IMMEDIATELY take them outside to go potty. If you catch them in the act: First of all punishment does NOT work! Dogs live in the moment, meaning a minute after they pee they already forgot! So taking them over to a mess that you find an hour later and "scolding" them or saying no just doesn't make sense. They don't understand English and basically all you're teaching them is that YOU are bad, not that the behaviour is bad. This is when you will get a dog that will simply not pee in front of you. Let's try to remember that it is a natural bodily function and to yell at them for doing it is like me yelling at you for breathing! All we need to do is TEACH them that in the human world, it is only acceptable to pee outside. When you catch them in the act the best thing to do is simply distract them. A simple "hey" or clap of the hands is enough. Quickly grab the end of their leash (leashes should be left on the dog all the time in the house! ), and take them outside to their spot. When they do pee/poop outside throw a party! It's better to PREVENT mistakes then to wait for them to occur! Leaving the leash on: Leave your dog's leash on inside and let him/her drag it around (in the already confined rooms!). This way you can quickly pick it up if you need to stop them from getting into something, jumping on counters, and having accidents. Remember that touch is reward, so anytime you touch your dog you are reinforcing the behavior they are currently doing (jumping on counters). Plus it's much easier to step on a leash than it is to catch a dog, and you wont need to fumble around trying to find the leash if you catch them in the act! Going outside: Pick a spot! It is a natural behavior for a dog to choose a spot in the yard where he/she prefers to pee/poop. If your dog has not chosen one already, pick one! Every time you go outside go straight to this spot. If your dog is not 100% housetrained, outside needs to mean pee/poop time ONLY! Meaning NO play! The problem is that dogs view outside as a really fun place to be, there are tons of smells, and birds and things to look at. They go outside, have a great time and forget to pee/poop. Then we bring them inside, let them off the leash, they become bored, and suddenly remember they have to pee/poop. This is when accidents occur! I like the word "hurry"; it's much more socially accepted than POOP! After about a month of consistently giving the cue as the behavior is happening, you will soon be able to say the command before they do the behaviour! Adding the command while the action is taking place helps your dog learn and relate the command faster than saying it 27 times before they have actually gone. Rewards: Remember that there are other types of rewards other than food! Find what your dog absolutely craves and use it as a reward. Some common rewards are: food, freedom, play, attention, and touch praise. So use these to get what you want by WITHHOLDING them until you get what you want. Remember that nothing in life is free! Any time your dog pees/poops outside you should be throwing a party! CLEAN UP! Clean up all accidents with a commercial odour neutralizer. I highly recommend *Natures Miracle. This type of product, readily available in pet supply stores, breaks down (using enzymes or bacteria) the organic matter that causes the odour. The APDT (Association of Pet Dog Trainers),UK is a voluntary organisation established to improve the welfare of dogs and the competence of dog owners. You can use their site to find a professional dog trainer endorsed by the APDT. The Dog School offers Obedience Training from our experienced Dog Training Instructors including dog training Greater London and in/around Surrey and Sussex. Locate a professional dog trainer in East Anglia and surrounding areas. Mel Bevan is a Jan Fennell accredited Dog Listener with Certificates in Foundation & Advanced Canine Communication for Amichien® Bonding which communicates with your dog using only kindness and understanding, no yelling, no aggression and no domineering behaviour. If all else fails, carry him outside when he starts peeing… It worked for me; just make sure you have good aim and a steam cleaner! I know how true it is that many dogs end up in shelters because the initial newness or excitement of having a dog wears off and then the realization of actual work involved sets in. However it doesn’t make it any less frustrating. I wish people would take the time to think about what it really takes to raise a dog correctly and give them the proper training. Helpful article – I see there’s also an article on papertraining your puppy. However, when I got my pooch, I found a lack of information on the web for people trying to move from a papertrained to a housetrained dog. For me, a dog-owner living in a flat (of which there are many), I found this the most difficult time. My pup became papertrained very quickly -associating the paper with the place to go was very easy, it took days. The process of then teaching him that outside was the place to go and removing the paper was very difficult, this took a year…at least. Granted he is not the most easily trained (half-Beagle – can be stubborn!!) but certain things were difficult – like how long until you remove the paper altogether, how to build a routine up (when you have previously let him go when he pleases as long as he does it in the right place). This was an extremely trying time for me and although there are housetraining and papertraining tips, there seems little around how to move from one to the other…and unless you have a groundfloor flat with a garden, this is a common issue for dog-owners living in flats. My dog is now 2 years old and fully housetrained. The most important thing with housetraining is positive reinforcement and, to agree with the article and Jason’s comment, never giving up on the training or the dog, no matter how difficult it gets! My pitbull puppy trained herself. I got her in the winter, normally a bad idea, and just babygated her into one room where i had taken up the carpet and put down newspapers. Eventually she picked one corner to use and i took up the papers everywhere else. When spring finally came i gradually moved her papers toward the door, then began leaving the door open and putting the papers outside on the steps, then on the ground. She got the idea very quickly and soon i could close the screen and she would go to the door and cry to go out. For a while she would go where the papers used to be if nobody opened the door soon enough, but she soon stopped that and would hold it til she could get somebody to let her out. She was a very easy little dog. My dog will hold it all day ,but always go in thr night time when we are in bed, evenif she has been toilered just before we go…. How can I stop this? Very good advice. I think persistence is very important. It’s different with every dog as it took me much longer to train my Chihuahua than it did to train my Sheltie. Rewarding helped the most, and as long as they knew they were going to get a Healthy Bones treat if they “pottied outside” they eventually got it. Don’t give up! It took my Chihuahua over a year to get the hang of potty training.